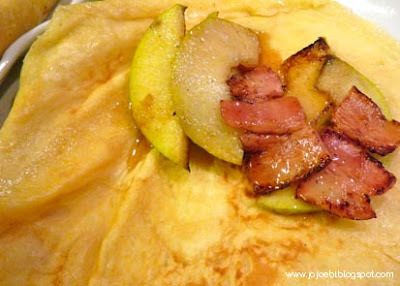 As The Netherlands is the theme for the month I asked a Dutch friend for some recipe ideas, one she suggested was for apple and bacon pancakes. This was a perfect recipe for Ebi-kun to get involved with. 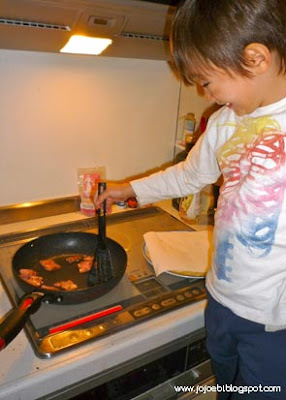 He mixed up the batter mix and did most of the cooking. Want to make some? the recipe is here. The recipe says that the yield is for 8-10 pancakes, I wasn't sure how thick they were supposed to be and made them a little thicker that a traditional English pancake (which is more like a crepe than an American pancake) and I managed 5, although the first one was really thick! We also used maple syrup instead of stoop but we will certainly be making these again, delicious!